Chevrolet TrailBlazer Pros and Cons | Page 1 of 1 | Why Not This Car? What drives people to buy (or not buy) a certain car? TrueDelta's members share Chevrolet TrailBlazer pros and cons based on their real-world driving experiences. This is not a bad vehicle, but in general it has required a more repairs than many other vehicle than I have owned. There are known weaknesses with every vehicle and the internet has made finding them very simple. I am tall (6'6") and fit in the front seats and am able to drive it. That is rare and good. 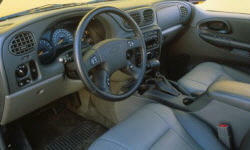 Comfort is high for a GM product. We got nailed in a lease and the dealership helped both find a good substitute we liked and was at least at the top end of our affordability. The inline 6 cylinder version that I have is quite powerful and still provides decent fuel economy for a larger SUV (around 18.5 with 75% highway driving at 60 mph). I recently purchased slightly larger tires and my fuel economy is suffering by 10% compared to stock tires, but I was anticipating this anyway. 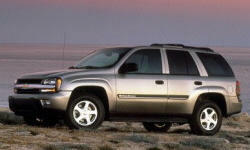 The trailblazer provides ample interior room for a family with kids and large dogs. With a pet barrier in place, the rear cargo area has enough room for an 80+ pound dog to lay down. I had a Pontiac Bonenville and previos to that had a blazer. Missed 4 wheel drive in New York winters. Excellent head room, adjustable lumbar support and pedals for shorter drivers. The rear glass appears to wrap around because of the glossy black pillars, the current grill is far nicer than the old chrome bar design, and the fender bulges are nice. Also like the headlamp design and the way they slant down to the inner edge. The large tires and the seats really are comfortable. The 4200 i6 is a very strong engine, and the 4 spd automatic works well with the torquey motor. Extremely smooth engine, and fairly quiet, even at higher rpms. Overall aesthetic appeal. Nice two-tone paint job. Lots of grunt and pulling power for a six. Very quick acceleration for a larger SUV. Has greater capacity than "crossover" vehicles.